I was speaking to someone last week on the subject of grief after a crisis. For some, grief hits immediately. For others, the grief strikes later, after the adrenalin has run out. For some it's severe and sudden. For others it's more slow release. And it takes its many forms - sadness, despair, denial, anger, depression. Last week, during the course of this conversation, I learned that no matter how the initial grief is experienced, there can often be a new wave of grief about three months after the event. This is true for personal bereavement and also for large scale crises of the ilk we have seen this year. And this grief at the three month mark is a very difficult and confusing time. The immediate crisis is over. Maybe recovery and restoration (physical and personal) is underway. And suddenly in it whooshes. It can be hard to understand what's going on. Hard sometimes to even connect this grief with the events that took place three months ago. You wonder whether you might just be going crazy. It has been a difficult three months. We have seen floods, cyclones, bushfires, earthquakes, a tsunami and the disabling of a nuclear reactor. Each new crisis has taken the attention away from its predecessor. But while out attention is diverted, the ones who lost family, friends, homes, maybe their livelihood to the earlier disasters continue to live with the effects of their crisis. Our attentions and prayers have rightly been upon those caught up in the horrors unfolding in Japan. But it is important to pause and count back. The January floods happened about three months ago. If you know someone who was affected by those floods, why don't you check in on them. They may be fine. Grief is not text book. It may be though that they are feeling a bit wobbly just now and just don't know why and don't what to do with it. Let them know that this OK. Give them another hug. And pray for them all over again. We sang this at church this evening. Glorious. Back when I was teaching I used to say to my year seven students, "There are two rules for life. Be nice to your teacher. And be nice to your mummy. If you do these two things all will go well for you." Of course they would laugh. When you are twelve years old you don't call your mum "Mummy." But making twelve year olds laugh is one way to make them listen to you! In a similar vein to the year seven rules of life, but far better, my husband farewells our boys off to school each morning by saying, "Be a blessing to your teachers and be a blessing to your friends." Such wonderful words for them to hear as they head off for their day, most especially because they understand, at least in small part, what it means to be a blessing. I have been dipping into The Valley of Vision again recently. At the back there is a set of prayers for the week - one for each morning and evening. This morning's prayer - the prayer for the sixth morning of the week - finishes up with some wonderful words that amplify an aspect of what it means to be a blessing to those about us as we make our way through our day. And may every place and company we are in be benefited by us. The line "Let us as Christians fill our various situations in life," particularly caught my gaze, that "every place and company we are in be benefited by us." Beautiful. A helpful thing to bring to mind while travelling through the day. And it reminded me of this...I have thought about this subject before. We have tried various things - some years completely over ambitious and other years completely underwhelming. Last year we tackled the last few chapters of Mark in bite sized readings, one a day for the twelve days leading up to Easter Sunday.Why twelve? For the sake of a dozen eggs, in our case courtesy of Kinder Surprise - each with the reference for a daily reading enclosed. "Trembling and bewildered, the women went out and fled from the tomb. They said nothing to anyone, because they were afraid." which was a rather abrupt and unsatisfactory finish to what should have been a glorious moment around the Easter Sunday breakfast table! A friend who did this along with us, whose children are a little older, also commented that at least one of her daughters found the readings, day after day, too intense given the challenging content. And each year I have felt that we really shouldn't stop on Easter Sunday with the resurrection. A few important things happen after Jesus' resurrection that ought to be mentioned like Jesus' physical proof of his resurrection, how Jesus shows that the Old Testament pointed to himself, how he planned to send the Spirit when he returned to the Father's side and how we all have a job to do in light of all of this. 1. I will not be a slave to a dozen eggs! I am sure the boys will oblige in having a few more Kinder Surprises to add to our empty egg collection. 2. The plan spans the four gospels and features each of the key events leading up to and covering the Easter story. Where there was a choice of renderings I selected the one I thought was the most concrete and readily accessible to children. Ultimately it will be good to be reading through each of the gospel accounts of Easter in their entirety but for now, this gets the full story across. 3. We are planning to start soon so that we don't need to do an Easter reading EVERY day for the next twenty one days, to assist those (praise God) whose tender hearts find the content overwhelming. As I write this there are six weeks until Easter so that gives plenty of time to get through all the readings comfortably. 4. The aim is to reach number sixteen on Easter Sunday - and then cover the last five over the following week or two. 5. We probably won't do all twenty one readings straight from an adult Bible. (The CEV Bible, by the way, is a very user friendly adult version to use with children - written in very plain English.) To keep their interest up we will probably mix and match -a bit of adult Bible, a few readings from The Jesus Story Book (which covers the Easter story really well) and from other children's Bibles knocking about the place, perhaps listening to an audio version here and there. We will mix and match as much as is needed to hold the children's interest. And while that is happening I will also be doing my own reading leading up to Easter. 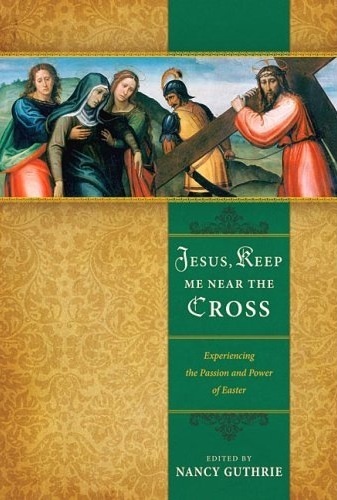 It's time to start dipping into Jesus, Keep Me Near the Cross edited by Nancy Guthrie. There are twenty five readings - which is about four readings each week in order to reach the end by Easter Sunday. I am really looking forward to carving out a few quiet moments with a cup of tea a three or four times a week to work my way through this anthology. I think I will begin this project tomorrow! Jesus' attitude to sickness here is parallel to 9:3: the sickness provides a platform so that the 'work of God might be displayed in his life.' What is true here at the level of physical illness can be extended to all the trials we face as Christian disciples. Our natural response is to rebel against them as alien intruders, which must be expelled from our lives as quickly and painlessly as possible by every means available, including God's miraculous intervention. With hindsight, however, another perspective is possible. We can offer our trials to God for him either to remove or retain as He pleases, thereby bringing glory to his name and deepening our faith, and possibly that of others too. Joni Eareckson Tada, a paraplegic sufferer, authentically expresses this second alternative. "I do not care if I am confined to this wheelchair provided from it I can bring glory to God." The same conviction is expressed more generally by Hudson Taylor. "Trials afford God a platform for his working in our lives. Without them I would never know how kind, how powerful, how gracious He is." While we may feel daunted by the heights of devotion reflected in these quotations, we can all make a beginning in our present pains by offering them consciously to God for His using. From such small seeds a new maturity can blossom.